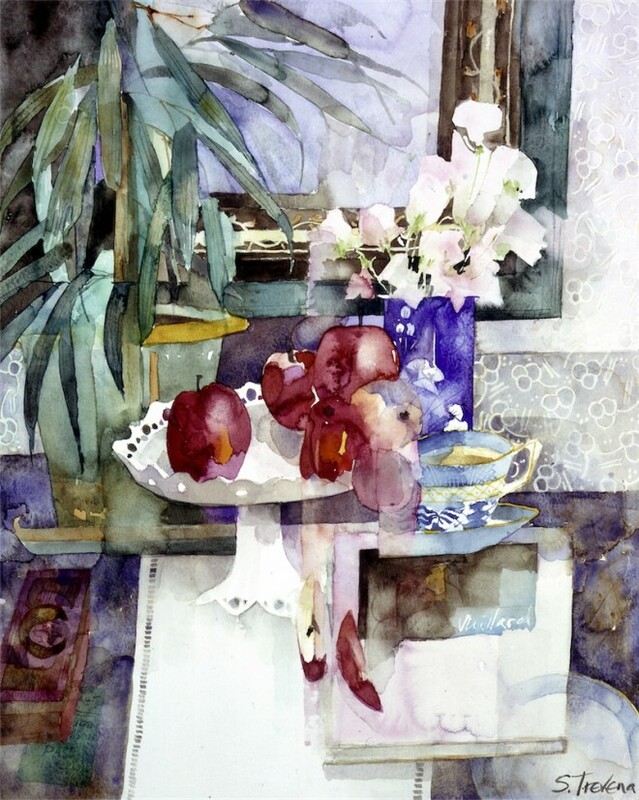 Shirley Trevena’s new book ‘Watercolours’ is a stunning, linen bound compendium of thoughts and images from the esteemed painter’s creative life. 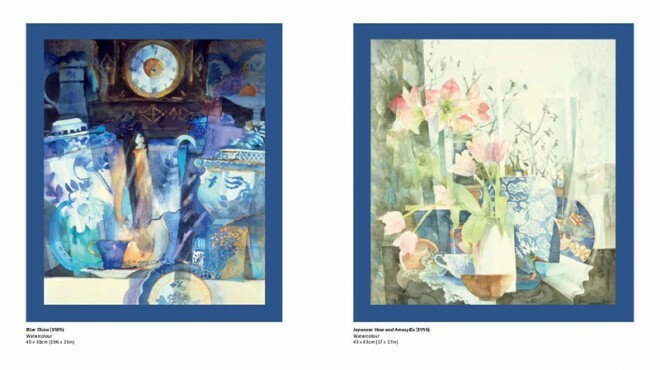 Unlike her previous books, ‘Watercolours’ is not a ‘how-to’ instructional book, but rather a sensitively compiled collection of paintings and drawings that chart her life in art, from age 7 onwards. Accompanying the images are Shirley’s honest and fascinating anecdotes about her approach to painting, her frustrations and successes. Shirley’s work is inventive and expressive, and her fascination with colour, form and pattern take her on the most visually intriguing adventures. 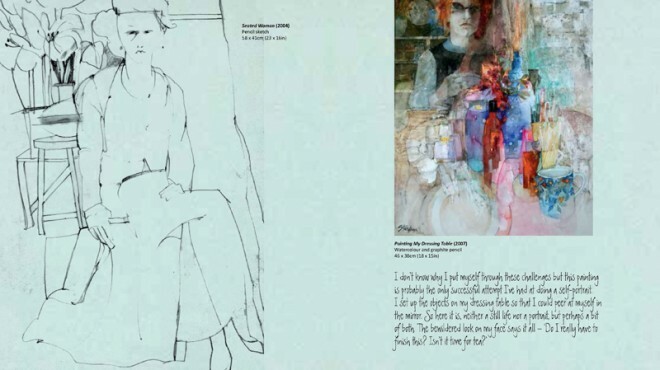 The energy that courses through this account of Shirley Trevena’s career is sure to be a great source of inspiration for artists everywhere, and a feast for non-artists too. 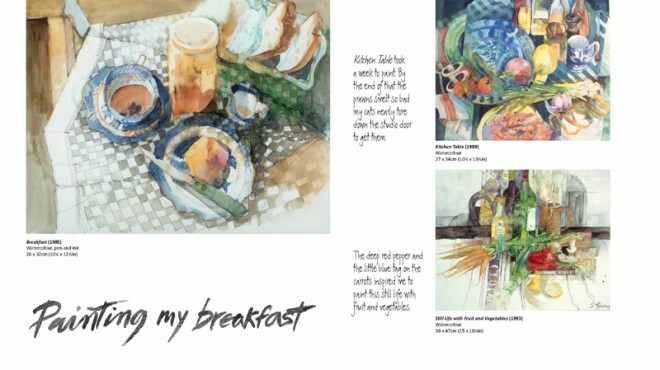 Lisa: The book is a beautiful linen bound publication with personal annotation; honest accounts of how you remember painting individual pictures, and the challenges you faced that I’m sure will be hugely appreciated by many of your followers. What gave you the idea to put this book together in this incredibly personal way? Shirley: After writing ‘3 how to do things’ books I felt I had said just about enough on my ideas on how to put things down. At the moment I am working with a friend to put together a scrapbook that describes my painting adventure. It gave me an idea that the people that enjoy my work really don’t know about the various and very different types of work I have produced and so the book is sort of like a scrapbook. Lisa: In the introduction you say that you have included paintings that in your opinion ‘are the best [I] have ever produced’ – what qualities do the best works have to make them the best? Shirley: I think artists are the hardest judges of their own work. The works I have singled out as the best have that extra something I’m trying to achieve, it could be a strong composition or that my application of paint has been fresh and immediate. Lisa: The reproductions in the book are stunning and you show off the gorgeous palettes that you use – was it difficult to get the reproductions to look exactly how you wanted them? Shirley: I designed each spread for this book and so every colour was very important to me. I am delighted with the final results, we never had to change a thing. Lisa: There are quite a few paintings in the book that you have painted while abroad. Do you always carry watercolours with you just in case you stumble across subject matter that inspires you? 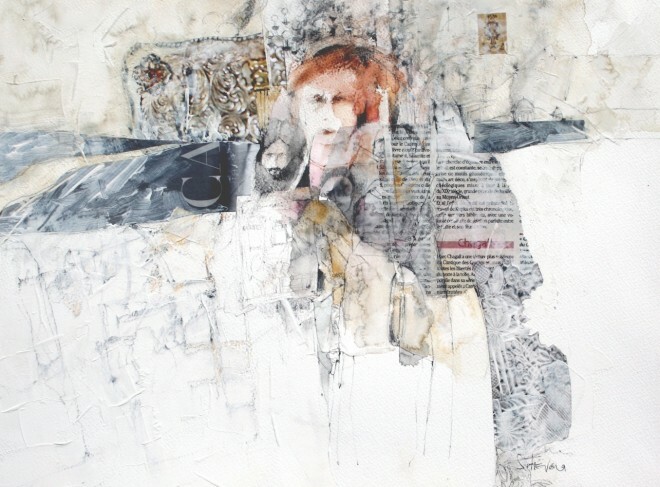 Shirley: I don’t do preliminary sketches, but if I go on holiday I always take my painting things so that I can carry on working even if that means in France, the landscapes, or in a small hotel in England some tiny objects that inspire me. Lisa: There’s a quote in the book ‘Deep purple lilies in a bucket outside a florist’s shop are hard to pass by. My first thought, ‘How many shall I buy?’, my second, ‘How do I mix that colour?’ Does this quote imply you try to keep the colours in your paintings true to life, or more that you use the colours from life that inspire you as the basis of the colour theme/palette that you end up working with? 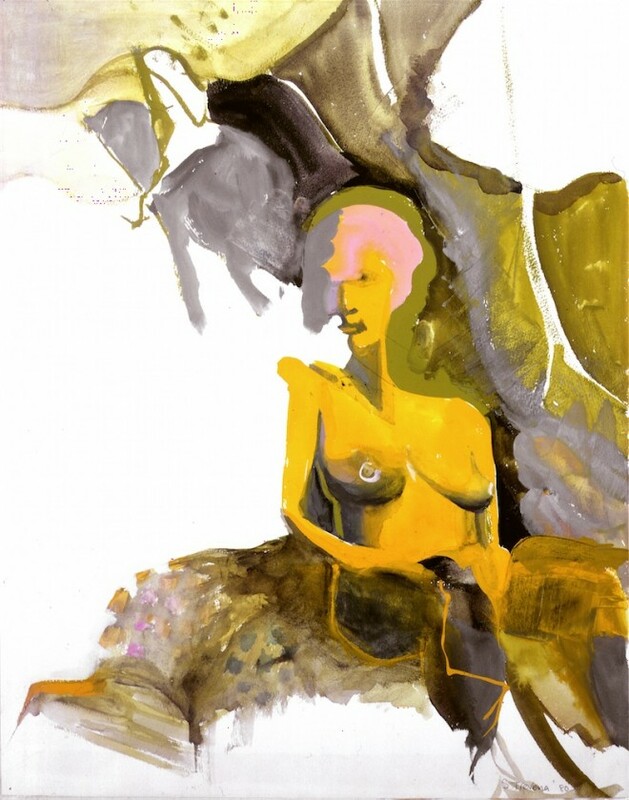 Shirley: My inspiration comes from seeing an object or colour that is exciting to me. If it is the colour of one flower in my still life set up I try to keep true to that colour, even if I change everything else. Lisa: Do you always make a preparatory sketch prior to painting? Shirley: If there is a preparatory sketch it’s usually on a tiny piece of paper on an envelope, just a basic idea. Lisa: I love the honesty of your quote describing your experiences of painting ‘Painting My Dressing Table.’ You say ‘The bewildered look on my face says it all – ‘Do I really have to finish this? Isn’t it time for tea?’ – Do you really ever feel like this during the painting process and if so, do you feel it’s ever worth pressing on with this mindset? Shirley: Yes, absolutely true. I often think ‘is this painting ready to be binned’ or worse still ‘ cut down to the size of a postage stamp. Sometimes I get asked ‘do you still do your painting? It’s good to have a hobby.’ My answer to that is that ‘it’s my job’ and I know that not everything I do is going to be framed. But would I give up painting? No, never. 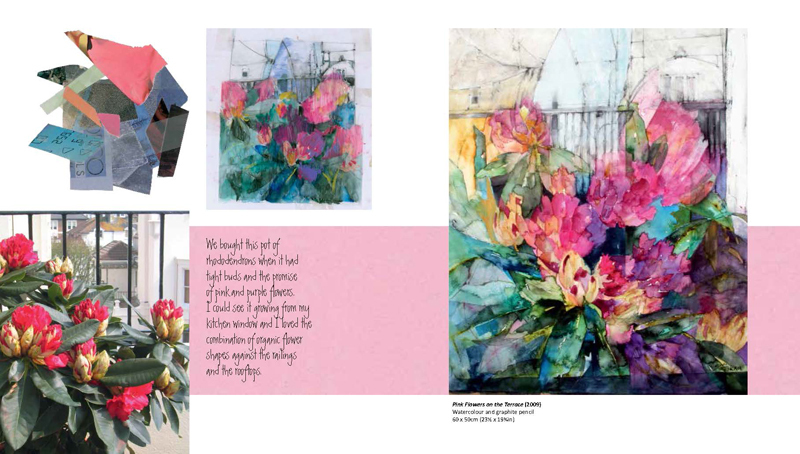 Lisa: In the work ‘In The Pink’ that is illustrated in the book you combine oil pastel and watercolour. How often do you experiment with unconventional combinations of art materials in your studio? Shirley: I often experiment with various media but always go back to my first love, watercolour. Lisa: We know you’re a big fan of Daniel Smith watercolours, but I’d like to know about the brushes you prefer to work with. What qualities must your brushes have? Any favourite brands? Lisa: What’s next in the work schedule? 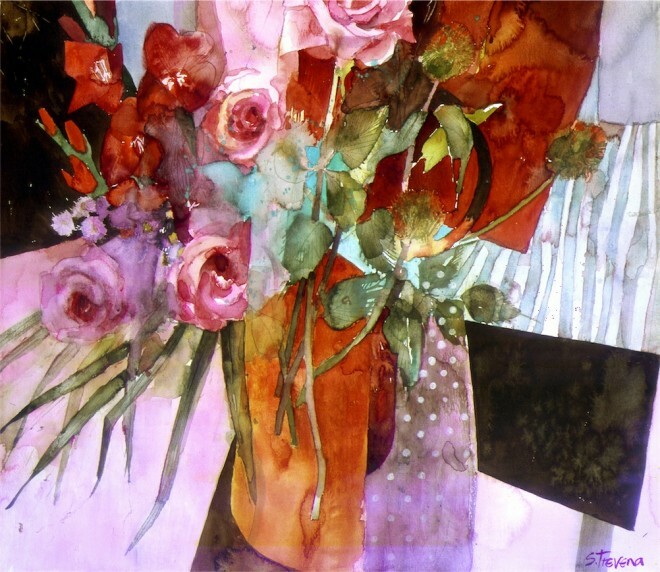 Shirley: I am now the President of the Sussex Watercolour Society and we will be having our annual exhibition in August (22nd – 30th at The Foundry, Old Market Lane Garage, 32 North Street BN7 2PH). After that I will be getting back to work to search for that all-elusive perfect painting. 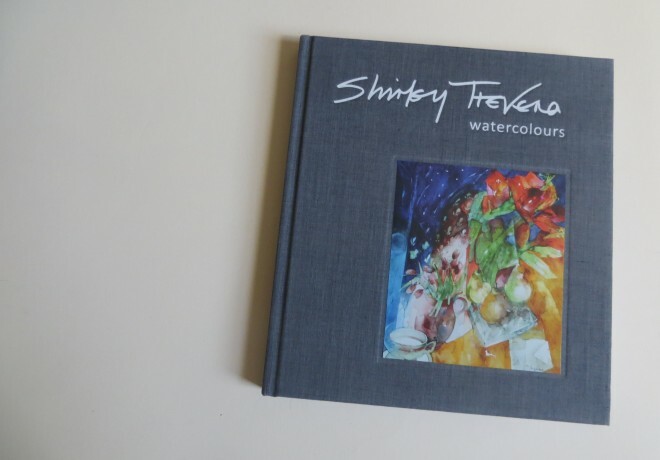 Thank you to everyone who entered the Shirley Trevena ‘Watercolours’ book giveaway – we received hundreds of entries over the past week! However we can only have one winner and Cayley Godfrey from York is the chosen one. Congratulations Cayley! ‘Shirley Trevena Watercolours’ is published by Batsford. 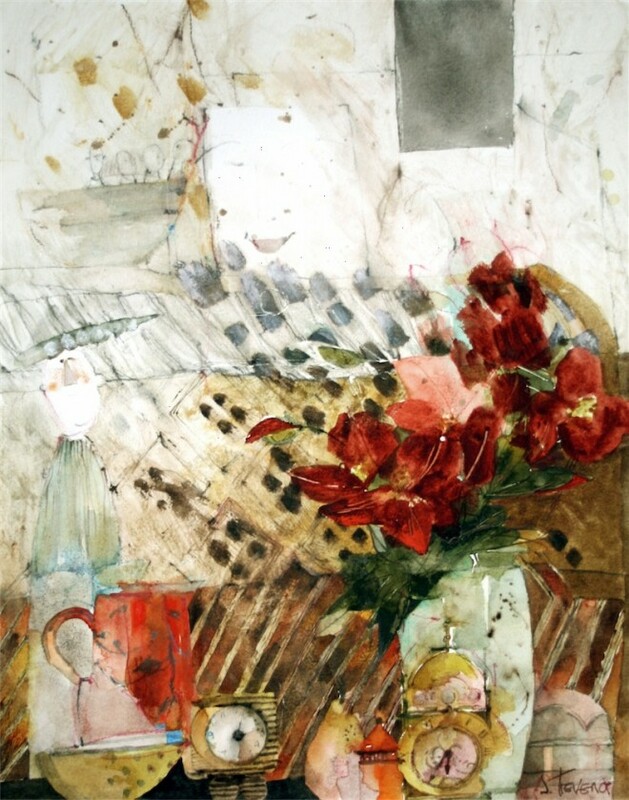 Artwork by Shirley Trevena. looks nice keep up the good work. Shirley’s favourite medium is watercolour. I have one of her earlier books. It is inspirational! 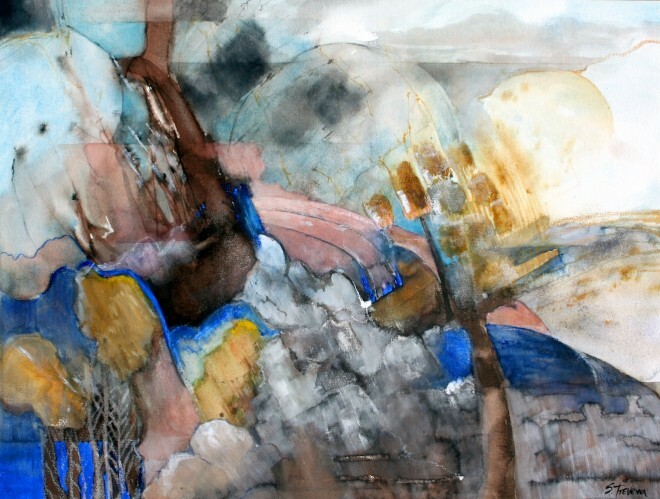 Her work is so inspiring and exciting, certainly a great artist to look at when starting out in watercolours! LOOK AT WHAT YOU DO. We will try our best to provide you will inspiration on this blog, have a browse around and do keep checking back. Maybe also try some of our dvds and books, they are great for inspiration. If you are on social media you might want to take a look at the Jackson’s Facebook page as that is always inspirational!